Most people can't say they’ve inspired their own hashtag. Enter Donald Trump. The LA Times declared his presidential bid may be one of the costlier business decisions he’s made. Mexican artist Dalton Avalos Ramirez reproduced Trump’s likeness on a piñata so local kids can have a whack at him. So, what did he do this time to inspire so much ire? On June 24th, Trump announced his campaign seeking the Republican nomination. He couldn’t help but besmirch the character of immigrants while discussing his position on the issue. 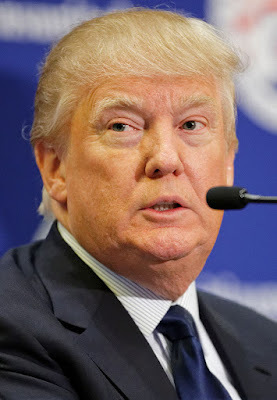 According to him, or maybe his hair piece, the immigrants coming here from Mexico “[aren’t] their best. . .They're sending people that have lots of problems, and they're bringing those problems with us. They're bringing drugs. They're bringing crime. They're rapists. And some, I assume, are good people." Needless to say, people didn’t take too kindly to his disgusting generalizations, and they hit him where it hurts. Entire companies have started to shy away from Trump’s offensive comments, as well as individual celebrities. Organizations canceled popular events at his properties, too. Possibly most notably, actress and activist America Ferrera penned an open letter to the business mogul thanking him for mobilizing Latino voters straight to the polls better than any registration drive could. In 1989, he spoke out against affirmative action, stating he wished to be a black man because they seemed to have a clear advantage these days. This was noted with no sense of irony. Several times, the Department of Justice sued Trump Management Corporations. The first suit alleged that the real-estate company discriminated against blacks who wanted to rent apartments in several boroughs of New York City. The government charged the corporation with “quoting different rental terms and conditions to blacks and whites and lying to blacks that apartments were not available.” Three years later, the DOJ again charged the company for continuing to discriminate in the same ways. Eventually, the New York human rights commission decided to dispatch investigators to keep an eye out for discriminatory practices. And who can forget his “special” relationship with President Obama? During the 2012 election cycle, Trump jumped on the conspiracy bandwagon and accused Obama of ineligibility because he was not born in the United States. Even after our president unnecessarily provided his birth certificate, proving he was born in Hawaii, Trump accused the document of being forged. This established him as some sort of hero among Republicans. In true Trump fashion, many times he filed counter-suits and blamed others and “PC culture” for daring to hold him accountable for his bigotry. If Donald Trump wants to stay in this election, it might be a good idea to work on his public image. He can’t change what he did in the past, but he could definitely tread more lightly. Kareem Abdul-Jabar suggested that Trump only currently polls so well because he provides “entertainment” in the campaign. Jon Stewart pointed out that he now has great material for the remainder of his tenure on The Daily Show. So it’s not all bad.